Hello, Radiant One. In today’s episode, I want to share with you about the power of a sacred collective, the power of having a sacred community, a group, a circle to which you belong, in which you can share your deepest and darkest fears or most troubling insecurities and also your magnificent accomplishments and acknowledgements. This episode is inspired by an incredible, beautiful, soulful, heart-based entrepreneur named Sophia. She was part of the beta test that I did for The Magdalene Rising Mastermind. Once the beta test was over, I wanted to check out the format and I wanted to check out just to make sure that everything was okay for the full run. When it was over, she was gracious enough to join me in an interview or a feedback/testimonial video you can find that – it’s actually on the mastermind page: Mariaestela.com/mastermind. I asked her to join because I wanted to see what benefit she’d gotten out of being part of it. One of the things she mentioned was how incredible it had been for her to have a place or a space where she could go in and feel seen, heard, and met, not only by me as a leader, as the guide and the coach and mentor but also by her sisters, by those that were with her in the group where very quickly a strong bond was formed and these ladies were – I’m going to try to share about this without crying because it just gives me such deep gratitude to see what happens when we form those bonds and how uplifting and inspiring and supportive women can really be. I know that in the world there seems to be this thing where, you know, women are each other’s worst competitors. That is not my experience. That’s not what I see, not in my one-on-ones or in my masterminds or in my group work. What I see are powerful, strong women who have soul-driven, heart-based businesses come together to support and uplift each other and that is, to me, deeply, deeply gratifying and it’s part of why I love what I do so much. In terms of sacred collectives or sacred communities or circles, women have been gathering for – forever, I want to say. I was going to say millennia but I don’t think millennia even covers it. I think that we have been used to gathering in circles forever, for infinity. I think that that is going to continue forever. I think there is a very, very powerful energy in that and I think that when women come together, we can really do about just everything that we set our minds to and our hearts to, especially. So when Sophia shared how that had given her – one of the things she said was that – and I get this and I’m sure that you get this as well because as a soul-driven, heart-based entrepreneur, maybe you have an online business like I do or maybe you have a business that maybe you don’t see your clients physically. You know, it can be very isolating. It can be very easy to fall into the idea that, “Oh, I’m in this all by myself” and especially if you are a spiritual entrepreneur because not only will you have the awaken and call within you. You will have spirit rising or your soul calling or whatever it is but then at the same time you also have your own journey of unraveling in terms of the world because what you do when you are a spiritual entrepreneur in the world that doesn’t necessarily believe in things that they cannot see or hear. So that’s why having a place to go can be such a powerful and rewarding thing. Those who know me will know that I don’t ever force any sale upon anyone. I believe that if you are to be part of one of my masterminds or of someone else, you know that. It’s not something that I have to drive home within you. There’s a resonance and if that resonance is right, you and I will be brought together. Now the reason why there is such a power in a sacred collective or community or circle is that it creates for you a safe and a sacred space in which to expand from and that is whether you are at the beginning of your business and you know your business is just started and gotten off the ground or you’re more settled in your business. Wherever you’re at, there’s going to be – you’re going to be facing challenges and obstacles and issues and things that will come up in a, you know, bigger or smaller scale. One of the things that Sophia shared as well was that having a place to go to ask questions and not being afraid of sounding stupid or naïve or as though she wouldn’t be heard or met or seen which is not what I ascribe to. That is just – I can’t begin to tell you how powerful that is. Like I said, she couldn’t either and that’s why she shared it in that video. You didn’t receive your calling by accident. Now my heart in terms of creating space for spiritual entrepreneurs really comes from a space of wanting you to know that whatever it is that drives you, whatever the call that you have received, I want you to know first of all that it’s not by accident. You didn’t get the call by accident. You got it because you’re you. You got it and it may seem as though you got it – maybe you just got it recently or maybe you’ve had it for years but you got this call because of who you are not only as a person or a human being but as a soul. You received your call because you’re you. This was the call that was your next step and everything that you have gone through in your life whether you’ve had a corporate career before or been a stay-at-home mom who’s now entered into the business world – all of those things that you’ve done, those are your golden nuggets. Those are your pieces of wisdom that you’re going to be bringing into your business. What a sacred community allows you to do is to expand from a heartfelt place. 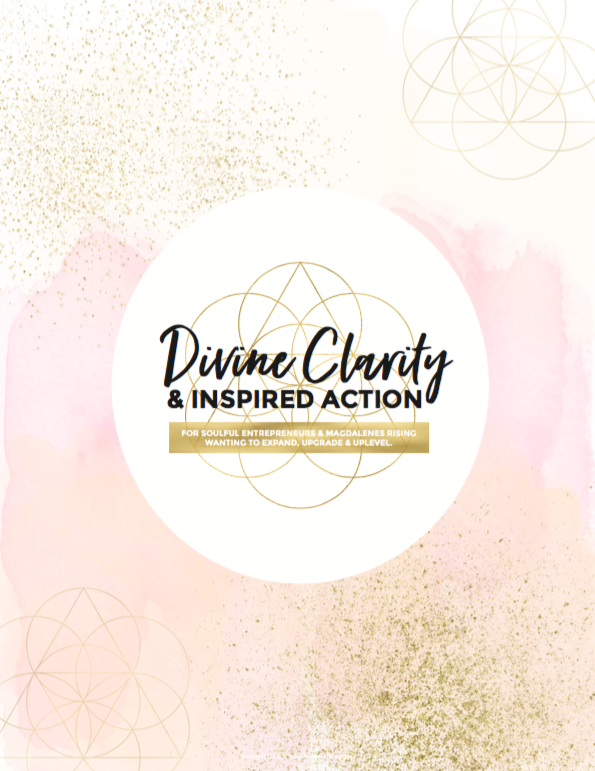 What it also allows you to do, at least if it’s part of my services, is that it also gives you accountability and support because there are times in our journey as a spiritual or soul-driven, heart-based entrepreneur where things don’t go our way. So we want to run and we want to hide. Well, if you’re part of any of the groups that I hold space for, that’s not really an option and I mean that in the most loving, caring, kind way because I know what you came here to do. I know that you came here to rise above your circumstances. You came here to really share with the world that which is coming through you. That means that it’s not really about you. It’s about what you’re here to be and to do for others, how you’re here to be and do and of service. Now, you can find – of course, I offer a paid service. I offer a mastermind but you can also go ahead and find a group of people who can perhaps support you in your journey. If you’re someone who’s looking for a sacred collective or community, what I would encourage you to do is check out your local listings or go online. There are also different groups. Meetup is also a place that has groups. You can go on Facebook and search within your community. You can ask perhaps if you’re in a place where they have metaphysical stores, you can go ahead and ask there, and then of course there is the option to join The Magdalene Rising Mastermind that starts in January. Right now there is an amazing early bird offer that you can go ahead and check out and I also, if this is something that you’re interested in or would like to explore and you’re not certain, I offer discovery calls for the mastermind. That means if you’re uncertain about something, we can simply join and when I join with people in discovery calls, I don’t join for the sake of selling. I join for the sake of serving. So my intention when I come into a call, whether it be for one-on-ones or mastermind, is really to ensure that we’re the right match and that what I have to offer is the right thing for you. Because I know that if it’s not, it’s not going to work and that’s not good for you and it’s not good for me. So that is really my philosophy on discovery calls. I know it differs from a lot of other people but that is really my philosophy and to me it works. So the power of a sacred community really allows you to have a sacred space from which to grow. It allows you to heal parts of yourself because you will be having reflections in the other women. In what they share, you will hear yourself and you’ll be able to recognize yourself and so it’s really group healing as well. It will also let you know that you’re not alone and that you’re not a freak or cray in any sense. I hold space for people who thought they were very cray when they first started and just find out that that’s just who they are and that they’re not cray. Yes, it may to the world seem to be far out but who’s to say what is far out and what is far in? So if you’ve listened this far, I would love to hear from you. Do you have a sacred community? What benefits has it given you to be part of a sacred collective?